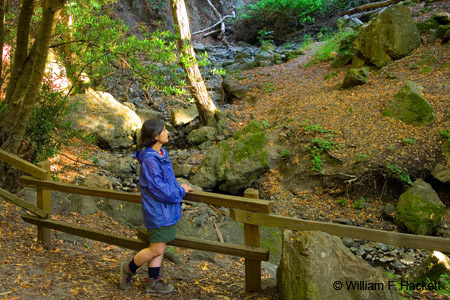 Just east of the Berkeley Hills and west of the San Pablo Ridge in the San Francisco Bay Area is Wildcat Canyon, a narrow valley that is drained by Wildcat Creek. Wildcat Creek flows northwest and empties into San Pablo Bay. Two minor lakes, Lake Anza and Jewel Lake, lie along the course of the creek. A history of the Wildcat Creek Watershed is here. The photo above shows a portion of the canyon named Wildcat Gorge, below the Lake Anza dam. An active tectonic fault (the Wildcat Fault; Do you see a pattern here? ) runs the length of the canyon. Wildcat Canyon was named for the mountain lions that were once fairly common in the area. At the northern end of Wildcat Canyon is Wildcat Canyon Regional Park. The southern end of the canyon was incorporated into Tilden Regional Park in the 1930s. Wildcat Canyon can provide a cooler place to hike on a hot summer day. 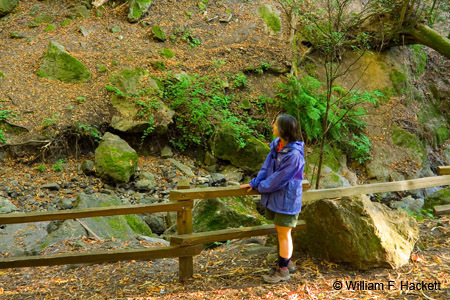 "Wildcat Canyon" was written on June 12th, 2008 by Bill, and filed under California,Photography.